Aah, spring…the aromatic blooms, the refreshing rain showers and the never-ending to-do list. This is the season for refreshing, reorganizing and rethinking after many long months of shuttering the house and letting the dust pile up. When spring rolls around, make sure you spend some of your chore time focusing on the outside of your house, too. The porch, patio, garage, shed and yard need some serious TLC this time of year as you prepare them for their seasonal debut and make sure they’re ready for the time of the year when they get the most use and abuse. If you’ve set aside a chunk of time to knock out some chores around the house, follow some of the tips on this list to help you make the most out of your cleaning time. 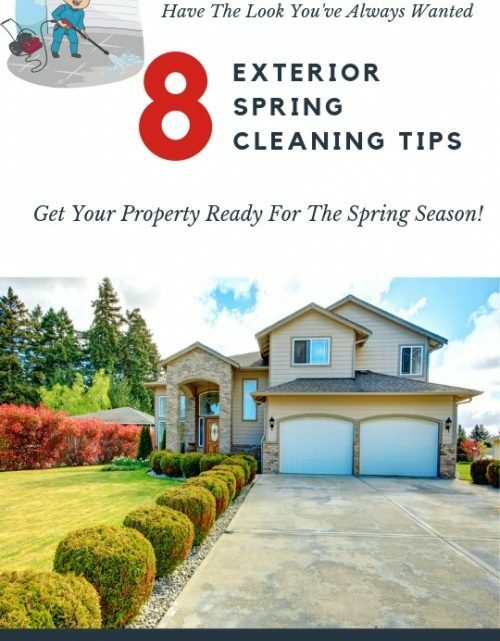 See some of my best spring cleaning tips for your homes exterior. Spray it Clean: Rent a Pressure Washer—Pressure washing uses a strong blast of H20 to break up and eliminate dirt, grime, salt, mildew and mold that has stuck to different surfaces, like your patio stones or the siding on your home. It’s an incredibly effective way to freshen up your exterior, but having a professional power washing service come and do the work for you can be costly. Instead, consider renting a gas or electric pressure washer from your local hardware store or rental supplier. Rental costs vary widely depending on location and model, but you can rent from Home Depot, for example, for under $30 for a four-hour period and under $40 for a full day. Bust the Dust: Don’t Forget the Outdoor Wipe-Down—We often start our indoor cleanings with a deep dust, but—despite the massive dust potential outside—many of us skip this step on the porch and patio. Make sure that you give the exterior of your home the same dust-busting treatment, by cleaning the blades of your outdoor ceiling fans and dusting off any dust-prone surfaces on the outside of your home. Whether cleaning in or out, make sure to dust before you sweep or vacuum to ensure that you fully get rid of all the particles that fall to the ground as you dust. Adios, Cobwebs: Put the Shop Vac to Work—Speaking of vacuuming…this is another chore that’s often unfairly stuck indoors. Invest in a hard-working indoor-outdoor vacuum cleaner (such as a Shop Vac) to get rid of all the accumulated cobwebs, leaves, dust and dirt on the porch or patio. You can even use certain heavy-duty vacuums for wet jobs to address any water that may have puddled in the yard or on the patio during the cold-weather months. Just make sure your vacuum is rated as a “wet-dry” vac if you intend to use it to sweep up liquids. Pick up one with an extra-long hose or lengthening attachment to help you reach high-up crevices, corners and lights. Light and Bright: Upgrade Your Fixtures—Spring is the perfect time to upgrade your outdoor light fixtures, including your landscape lights, exterior up-lights, security lights and general lighting on the porch or covered patio. Replacing any dingy or outdated exterior lights is a cost-effective way to majorly refresh style-wise, but it’s also an excellent way to help make your home more energy-efficient and cost-effective, especially when you switch to long-lasting, energy-saving LED lights. Polish and Scrub: Refreshing Outdoor Furniture—With anything outdoor living, storage is half the battle. If you’ve properly stored your outdoor furniture, grills, etc. then they should emerge in the spring looking clean and beautiful. But most pieces still need a good wipe-down. To refresh your outdoor patio furniture, consider the material. If it’s real wood, such as teak, you can revitalize dullness with a wood conditioner or polish. For metal, wicker or plastic furniture, use a gentle cleaner or soapy water and do a top-to-bottom wipe-down. Be sure to let your furniture dry completely (preferably in the sun, but by hand if needed) to prevent any mold or mildew from accumulating. Instant Refresh: Cleaning Patio Cushions—With patio furniture, the cushions tend to be the first to go. They accumulate mold, mildew, rips, tears and stains faster than almost any other outdoor accessory. To get some extra mileage out of yours, wipe them down a few times throughout the season using a mix of water and mild soap. Using a soft-bristled brush will help break up any loose dirt and stains. Though they are often the first to go, patio cushions are also the easiest to update. If they’re too dirty or if you just want a simple way to give your space a big upgrade, consider replacing cushions. Pro-Level Window-Washing: Invest in a Squeegee—Nothing makes your home feel quite as bright and new as a whole-home window-washing, indoors and out. If you plan to do it the DIY way, equip yourself with some professional-grade tools, like commercial squeegees that help you give all your doors and windows a complete upgrade. If you have a little extra room in your budget, consider paying a professional window-washer to do the job for you. You’ll be surprised to see how far this service really goes with regard to spiffing up your home! Reorganize and Donate: Clean Out the Shed—Spring cleaning isn’t all about scrubbing, spraying and dusting. It’s also about organizing and neatening up those spaces that have become overstuffed and overflowing throughout the winter. Make sure to give your shed, garage and any other outdoor storage areas the “keep, toss or donate” treatment so you free up some space for new tools and supplies and so you have some extra space to prevent clutter. Spring is the perfect season to ready your outdoor space for the best time of the year! When the porch, patio and yard feel neat, clean and welcoming, you’ll be excited to spend time in the fresh air when the warm weather rolls around. And remember, with spring cleaning, a little bit goes a long way. With just a small amount of effort, you’ll enjoy big returns! 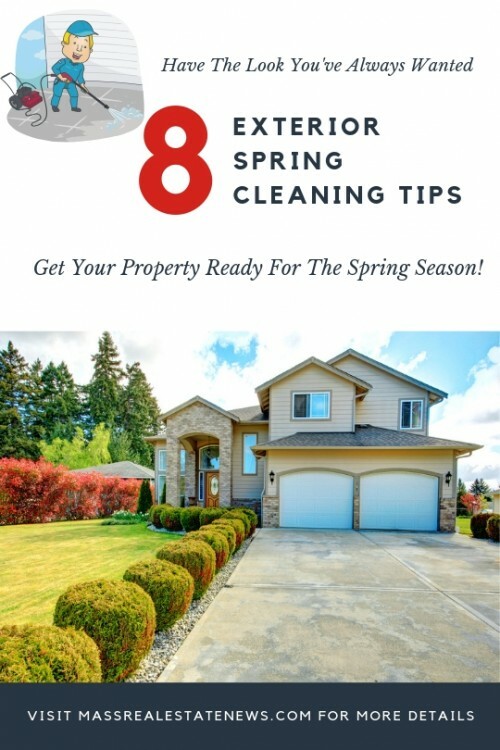 Hopefully, you have enjoyed the outdoor spring cleaning tips! How to increase your home’s value before selling via Article Cube. Use these additional resources to make wise decisions when you are buying or selling a home. 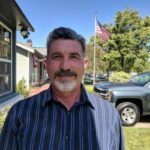 Author bio: With over 28 years in the ceiling fan, lighting, and fireplace business, Greg Tillotson possesses a unique blend of hands-on experience, product knowledge and creativity unlike any Webmaster in this industry. 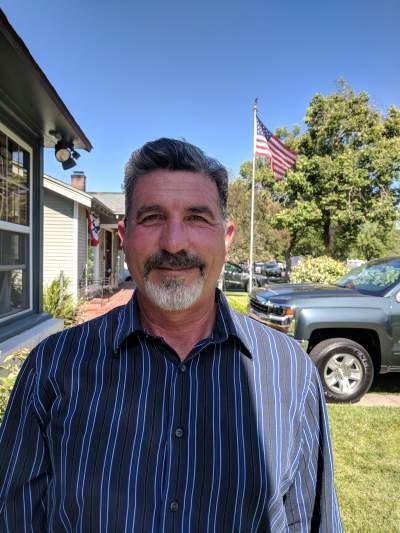 Greg is also a musician who taught himself to play the piano and composes.